The use of the water fed pole and deionization water filtration system, used in conjunction, is a relatively new technique being used in the window cleaning industry. Water fed poles are usually made of carbon, or carbon composite material, which makes them very light. Attached at the top of the pole is either a synthetic or boar’s hair brush that shoots out deionized water. The brush loosens debris while the water sprays off any remaining debris. 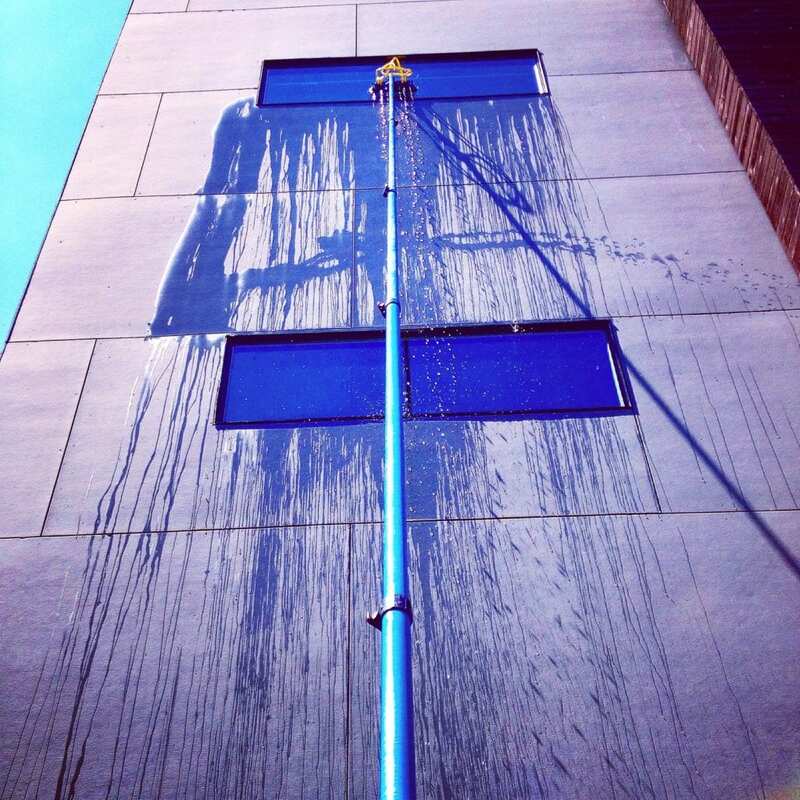 Water fed poles can extend up to one hundred feet allowing window cleaners to safely clean windows from the ground. This is where the deionized filtration system comes into play. Before the water even gets on the windows its run through a filtration system removes the calcium and magnesium ions just as in the normal softening process. Unlike home equipment, deionization units also remove all other positive metallic ions in the process and replace them with hydrogen ions instead of sodium ions. So when the water evaporates it leaves no sediment. At World Glass Window Cleaning we use this process for large commercial jobs and hard to reach residential windows. An added bonus of using this system is that it leaves your windows cleaner and for longer with repeated use. The old method of cleaning with soap, water, and then squeegeeing leaves an invisible, sticky, film that dirt sticks to. Deionized water alleviates this problem because there is no sticky residue left over. It does take at least two cleanings using the water fed pole/deionized water to remove any soap residue from past cleanings. Going forward this technology is only advancing ensuring cleaner windows and safer working conditions.